We are off on the most difficult challenge of my life - facing Mt. Everest at the base camp. Ours was the first of four 20 passenger planes to plow through the thick smoke and fog at Kathmandu airport at 6:30 in the morning. It’s always touch and go if the tiny Twin Otter props will take off at all. Today we were among the flying Yeti Airlines. If you could see how we fly, it would curl your toes. Everyone piles on - no seat assi gned - with their backpacks and trekking gear into seats hardly wide enough for a toddler, they lay their gear in the aisles, in the tiny space in front of them or on their laps. No overhead bind and the steps are two bars with no bannisters. There is a pretty Nepali stewardess in the Sherpa long dress with striped apron and she attempts to pass out cotton for the ears and caramels as we hip dance down the runway. Then we fly into the sun across the tallest mountains I’ve ever seen, ridge after ridge until suddenly the motors slow and a runway about the size of four football fields appears with a rock wall built against the mountain at the end. 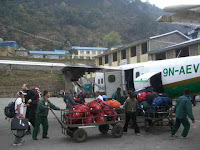 We land on two wheels and a prayer and everyone scrambles out into Lukla. This is the setting off point for all treks to Mt. Everest and the Sagarmanta Park, home of Everest and its sister peaks. As our bags are removed from the tiny pocket in the plane, others are being piled on and the plane leaves before we are through the exit gates and into the village. Then lands the next plane, and so on. There is even one helicopter flight. Outside the airport gates are stacks of men hoping to be chosen as porters for a trek. Jeta, our head man, sees porters he knows and signs them on to carry our extensive load. There are four of us now. Jeta’s cousin carries my backpack. But first we stop at the Nameste Inn for breakfast. It’s all so casual, the preparation of the meals. I had asked for a toasted cheese sandwich (it was on t he menu) and they had to go to the market to get a loaf of bread. There is no light in the restaurant, just daylight a bit reluctant to shine in but the interior is made in a blonde wood and tables with cushioned bench seats running along the wall. Outside one could see the activities of trekkers starting their days and also we could hear a puja in progress - that is a blessing ceremony at someone’s house - loud horns of three types, bells ringing, and chanting. This ceremony might go on for two or three days until the lama had cleansed everything in the patron’s home. I was ready to get on the road - to see how hard this was going to be. We haven’t hiked in a week. My muscles were tight. But to begin with after registering with the official trekkers office and the police we wandered through a few villages, very pristine and fixed up for tourist - two story gray stone buildings with white or blue trim on the windows and doors, some li ttle tourist shops for gear and souvenirs, but still, hovering even here, the horrible smoke from morning fires and the smoke still rising from the valleys. 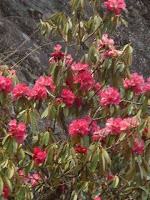 We began to see rhododendron trees in bloom, reds, hot pinks, whites, and also along the road violet colored primula. The road was full of rock, but not steps as in Annapurna. One had to concentrate to hit the right steps going down hill or up. It is tedious and a bit frightening because one false step and it could be over. 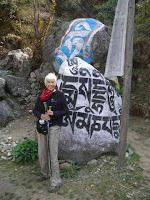 My sticks are my saviors at this point, and in these Buddhist towns we pass through arcades of prayer wheels, which we each turn, and also pass on the left side clockwise of the vertical prayer flag poles or giant boulders which have been tediously carved with the Om of the Buddhist chants. Jim never misses a one, so I follow. 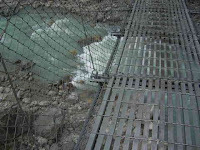 We cross swinging metal suspension bridges that take a kind of balance or a rhythm to master, they cross high over rivers or just canyons so I try not to look down and get dizzy. It reminded me of the "exposure" factor when climbing the Tetons. There’s a lot of space between me and below. 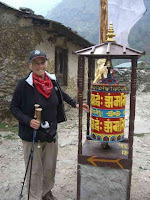 Overwhelming is the amount of trekkers and their porters going both directions. A real traffic jam at times if you both need to step on the same bunch of steps. Lots of Germans, French, Russians, and Chinese were returning from successful excursions, I guess. But I couldn’t look up to see their happy faces since I was concentrating so hard on stepping on the right step and not folding up into a falling ball. 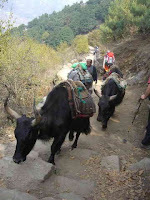 Zoes, a cross between cow and yak, pass on the trails, their bells ringing from their necks, and their backs loaded with packs. Donkeys too pass, and even a lady on a gray horse also with giant jingle bells who is being led by a sherpa. A-ha, I think. But Jim won’t even let me think about that. We trek for three hours before lunch. Since we arrived early this morning, we’d b e able to go further after the meal, once again, cooked on the spot. Stopping for lunch is never fast food. It’s lots of waiting for ingredients to be prepared from scratch. Most meals are potatoes or rice or noodle based with sides of greens. I tried yak cheese momo (potstickers) but there wasn’t much flavor to them. There are two kinds of chocolate Snickers and Mars bars in a display case. I knew I’d need energy food so chewed up a Snickers. There’s not much sugar in foods, only in tea, which my group drinks excessively. Tea is brought in giant thermos that are almost comical for their size. Each place we’ve stopped, the higher we reach, the thermos has gotten larger, encouraging guests to sit and drink a while. When we took off after lunch at Phakting (which was our original destination for night, but we arrived early), I was full of energy and set off first by myself. Of course, I did it slowly, as i nstructed, and finally everyone had caught up. We were all stopped by soldiers at the crossing of a river, who had to inspect our backpacks and luggage. This was a surprise but apparently is Nepal’s effort to appease China so there is no Free Tibet protests on Mt. Everest. We hiked along the Dudhkosi River, its water milky green because it was fresh melt from the and then began a sever upward climb which lasted about two excruciating hours. My muscles almost fell out of my skin and each step I wondered if I was not doing a foolish thing, would I ever be able to make it to my goal, and I concentrated on how exhausted I was. Each rest stop I tried to deep breathe as much as possible and drink water. Dehydration is an enemy, as can be the altitude. We went from 7500 feet, where we landed, down about 1000 feet, and then back up 8500 feet by the time we reached our destination for the night in Monjo. Jeta went ahead of us to look for a lodge with an attached bathroom. The room was new with bright colored bedspreads and pillows but I was so exhausted I just folded up in the bed using the sleeping bag as a cover and my cashmere blanket wrapped around my shoulders and neck. I tried to stretch my hips and legs, but after such extreme effort on the trek, all I could do was shiver from the cold. It took a while to warm up. There is no heat in these lodges, but there is a large stove in the middle of the dining area where everyone gathers for tea and food. We are too wrapped in a valley to be able to use the satellite to send the blog or emails. Tomorrow we’ll be up higher and in a more populous areas. Photos: Landing at Lukla; Brush the prayer wheel for luck; Rhododendrun trees; trail traffic - these are crosses between cows and yaks; A beautiful Nepali woman and child; Things we walk around to get right; a suspension bridge high above a river.